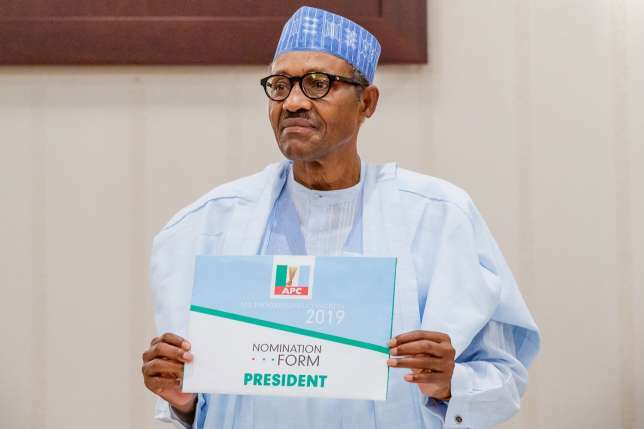 President Muhammadu Buhari has submitted his nomination forms for the 2019 Presidential election. The president submitted the Expression of Interest and Nomination Forms, on Wednesday, at the All Progressives Congress (APC) National Secretariat at Blantyre Street, Wuse II, Abuja. National chairman of the APC, Comrade Adams Oshiomole and some party bigwigs were on hand to at the Secretariat to receive the forms from the president. President Buhari had, earlier on Tuesday, received the APC expression of interest and nomination forms bought for him and presented to him by members of a group called National Consolidation Ambassadors Network (NCAN) at the presidential villa.